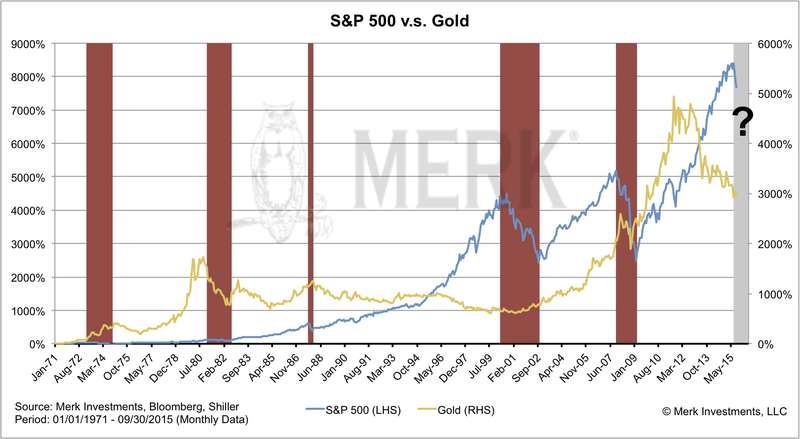 Merk Insights - Gold for Bear Market? 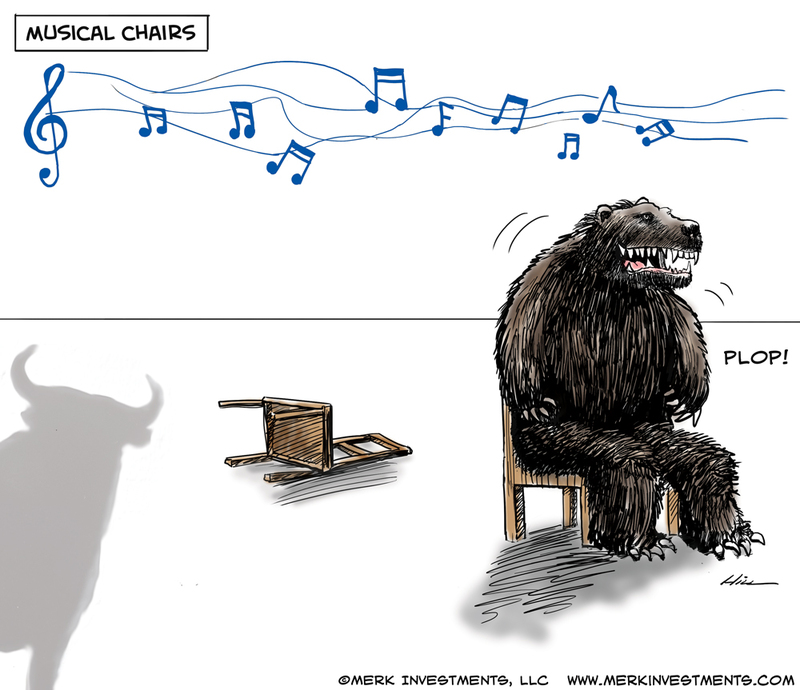 While some continue dancing, the music might have already stopped: are we already in a bear market in stocks? In this context, we study past bear markets to see whether gold may serve as a valuable diversifier for what's ahead. Are we in a bear market? A "bear market" is frequently defined as a decline of at least 20% in the S&P 500 index. Trouble is that by the time pundits provide their seal of approval that we are indeed in a bear market, the index has already lost 20% from its peak. Many of them will likely have told investors to buy the dips all the way down. In our August 4 Merk Insight Coming Out - As a Bear!, we argued that a bear market is about to commence. Mind you, that was just before the surge in volatility. At the time, some wondered why a "currency and precious metals" guy like myself would have anything to say pertaining to the stock market; just about a week later, there were numerous media reports blaming the currency markets for turmoil in the stock market. Go figure. We are not going to repeat the entire bear case again, except to summarize that we believe we have shifted from an environment where investors think the glass is half full to one where the glass may be half empty. This is largely induced by the Fed's attempt to extricate itself from its 0% interest rate policy; that's because, in our analysis, just as the Fed's extraordinary policies have fostered complacency, any attempt to move away from it may cause fear to return to the markets. There are numerous implications, but one of them being that investors may be shifting from buying the dips to selling the rallies as their focus shifts from chasing returns to capital preservation. How to prepare for a bear market? In some ways, whether or not we are in a bear market already is not the most important question. Instead, investors may want to ask themselves whether they are sufficiently diversified to be ready for the next bear market, which will eventually come. In the past, we have extensively discussed ways to diversify in an environment where many assets have been rising in tandem. We believe the tide has turned, and prices across a broad spectrum of asset classes may be at risk. We have discussed alternative strategies such as long/short strategies in the currency or equity space that each come with their own set of opportunities and risks. Today, we zoom in on gold. This discussion is not meant as an endorsement of any one tool to be used in a bear market. Instead we look at it in the context of the toolbox former Fed Chair Bernanke used to talked about: just as the Fed has had its toolbox, investors may to have one of their own to be ready for what may lie ahead. A key reason we look at gold as a diversifier is because of its low correlation to the equity markets. Correlation is a measure of how two securities or asset classes move in relation to each other. There are times when the price of gold moves in tandem with the S&P 500; other periods, when it moves in the opposite direction. When all is said and done, over the past 45 years, the correlation between the price of gold and the S&P 500 is zero. Aside from correlation, the other key ingredient investors may want to consider is the expectation of future returns. That's a sticking point for many, as this shiny metal doesn't earn any interest (unless leased out). Having said that, investors also typically use cash as part of their portfolio, often with little motivation to earn interest (indeed, interest on cash is also earned only when it is put at risk by, for example, placing it in a bank account, although government insurance schemes might mitigate that risk). It was in 2009 that real interest rates turned negative again. Clearly, appreciation periods in the price of gold does not exactly coincide with periods of negative real interest rates, as the price of gold bottomed out years before official inflation data suggested real interest rates were negative yet again. We raise this point as we do not see how the U.S., Eurozone or Japan, to name a few, can support positive real interest rates for extended periods given their government debt levels. Add to that our belief that the Fed all but promises to be "behind the curve," and we see gold as a diversifier that warrants a closer look. A central bank is considered to be "behind the curve" in raising rates when inflation is picking up, but rates are slow to rise, thus driving real interest rates lower. And this "promise" comes from our interpretation of the Fed's own words as FOMC statements have stated since the spring of 2014 that even as inflation and employment move back to what historically has been considered normal, rates may continue to be lower than what has historically been considered normal. We feel the latest back-pedaling by the Fed due to ‘global uncertainties' is just the latest step on the journey in what the Fed also refers to an attempt to be ‘slow and gradual' in raising rates. To make this clear: we don't think investors should only consider gold, or any other specific investment, only for bear markets. That's foremost because, as indicated at the outset, it's usually rather late in the game that one figures out that one is indeed in a bear market. If one is not sure of the timing, rebalancing one's portfolio during good times, i.e. taking chips off the table when markets rally, may be worth pursuing. Having said that, when times are good, it's just too tempting for many to coast along without thinking about the next downturn. That's why we are here to wake you up. Having said this, we think it is still very useful to see how gold, or any asset for that matter, performs when equity markets perform poorly. Below, we zoom in on bear markets since 1971, as that's when Nixon severed the last tie the greenback had to gold; to be precise, he "temporarily" severed those ties, allowing the price of gold to trade freely. While some might argue the price of gold might have had some catching up to do, please also keep in mind that the S&P 500 had just emerged from a bear market that ended in May 1970. So how has gold performed in past bear markets? During the five equity bear markets, an investment in gold came out ahead in four of them. The one notable exception is the November 1980 through August 1982 equity bear market, where the price of gold not only also declined, but had rather significant declines. One might be tempted to shrug that period off by suggesting Janet Yellen is no Paul Volcker. While we know of no economist who believes a Yellen Fed will raise rates as much as former Fed Chair Volcker did, the question, in our view, is whether interest rates may become significantly positive. We've already answered that question above for ourselves, but encourage everyone to draw his or her conclusions. After all, if rates do go up significantly from here, the price of gold may be dragged down. And we might want to add that just because the price of gold performed well in four out of five bear markets since 1971, there is no assurance it will in the next one. In our assessment, part of the reason the price of gold has done well of late despite the expectation of higher rates is because the market may be gradually pricing in that the Fed will indeed be "slow and gradual" in raising rates, whereas a more decisive Fed "exit" might have been previously priced in. In plain English, we think the market may have gotten ahead of itself, accepting the narrative that the Fed will raise rates as many other countries ease. We believe the market is gradually realizing that the Fed is far less flexible than it hoped it would be, thus causing a re-pricing of expectations. We don't think this will necessarily change the Fed's "desire" to pursue an exit. This re-pricing of expectations may have profound implications for the U.S. dollar, and with it, the price of gold. At the same time, the "desire" to pursue an exit may keep investors in the ‘glass is half empty' camp for some time. In fact, given the run-up in equity prices in recent years, we wouldn't be surprised if the looming bear market, if it indeed becomes one, will last at least as long as historic bear markets. Got gold? To continue this discussion, please register to join us for our upcoming quarterly Webinar. If you haven't already done so, ensure you don't miss it by signing up to receive Merk Insights. If you believe this analysis might be of value to your friends, please share it with them. This report was prepared by Merk Investments LLC, and reflects the current opinion of the authors. It is based upon sources and data believed to be accurate and reliable. Merk Investments LLC makes no representation regarding the advisability of investing in the products herein. Opinions and forward-looking statements expressed are subject to change without notice. This information does not constitute investment advice and is not intended as an endorsement of any specific investment. The information contained herein is general in nature and is provided solely for educational and informational purposes. The information provided does not constitute legal, financial or tax advice. You should obtain advice specific to your circumstances from your own legal, financial and tax advisors. Past performance is no guarantee of future results.